It’s real. And it’s sold out. If you can not be there, your iPad—or an iPad—can be there for you. A robotic double in your stead. Not only is this a super cool device, but everyone will wonder just how much you’ve been hitting the gym thanks to its slim profile. 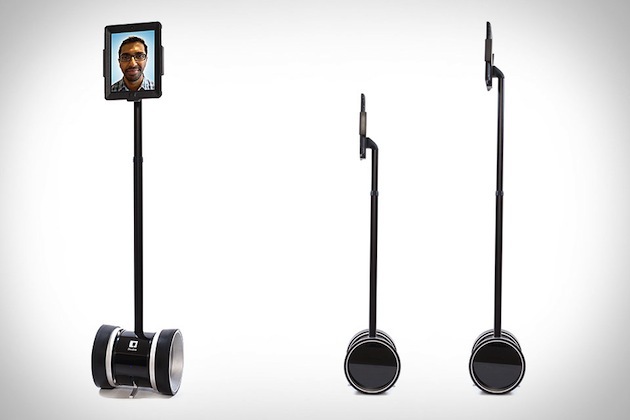 The Double Robot takes video conferencing to new level. With its height adjusting arm, yes, but also by its ability to move from place to place during the conversation. And it’s all remotely controlled by you. Wow. The only problem is: How do you get it there when you are here? Figure that out. I’m teasing. But I have a point. As cool as the Double Robot is, it is not you. And although the Double Robot has ingenious applications, it is not you. When it comes down to it—in most of life, in real life—you are the greatest asset. Your presence is powerful. And when life happens to friends or family—tragedy, or pain, or loss, or grief, or sadness, or anger, or rage, or depression, or fear—thats when we need one another. In the flesh. You don’t need to know what to say. Be honest about that. You do need to be there. You can pray silently. If you don’t know what to pray, know that the Holy Spirit will pray for you. Just be present. Don’t assume what the hurting are thinking or feeling. Ask. Take your cues—as to appropriate words and actions—from them. Talk and listen at their pace. But no one is as cool as you. Be there. Presence is powerful. You are welcome to share a comment about someone was there for you or share this post with that someone.